Here are some more benchmarks for a speed comparison between Ruby 1.8 (MRI), Ruby 1.9 (YARV), Rubinius and JRuby (brand new 1.1.1 release) and this time included in the package is also MacRuby 0.1 (r88 from the test branch to be precise) which I recently discovered (more on MacRuby soon in a seperate post ;) ). Also, this time is measured by the Benchmark lib and not from the time utility. Running Distance Calcutions using Graticule for Europe's 100 Largest cities with five iterations & rehearsal. Ok, the first thing I noticed is that once again Rubinius is not really usable for this particular piece of code (which was also the case with my precious benchmark) :( JRuby was also slower by 50% (on average) which means that I am either a bless or a curse for the Jruby team (it's the second time I give them "bad" results from a benchmark). Finally, the newcomer, aka MacRuby, is somewhere near (on average again) with JRuby. Not bad for a 0.1 release but it's not really that usable yet (my previous benchmark doesn't work yet - I created a nice ticket in their tracker... :D This bug seems to be fixed on trunk, gonna check it out later). The specs of the machine and the misc versions are the same with what they were before except the updated Rubinius. * : This may be the code for the benchmark but I also have a custom patched Graticule lib because Graticule requires the ActiveSupport gem which for the time being (and until 2.1 is released) it's incompatible with MacRuby. I think it was ok with the rest BUT it only uses 3-4 things from ActiveSupport and I prefer to copy them inside the Graticule and get rid of the "require 'active_support'" which makes the execution time increase about 10%. More on this also on a upcoming post. Migrating to Ruby 1.9 (YARV): Posts you have to read! 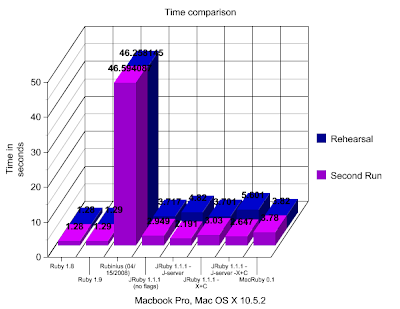 So, you are reading everywhere that Ruby 1.9 is faster than 1.8 (even I say so! :D ) and you want to give it a try or even port your existing code to it. Where should you start from? Here's a collection of links to posts, pages, discussions, etc with useful information. Matz on Ruby 1.9 from his Rubyconf 2007 talk. Migrating to Ruby 1.9, by Bruce Williams from his Scotland on Rails and Austin on Rails talks. Wild & Weird Ideas: An overview of Ruby 1.9, by Hlame from his LRUG presentation. Getting Code Ready for Ruby 1.9, by James Edward Gray II. On The Horizon : Ten Things I like about Ruby 1.9, by Gregory Brown. Ruby 1.9 porting notes, by Boga's Mac Blog. The release announcement of Ruby 1.9 in Ruby's mailing list. Installing Ruby on GNU/Linux(Gentoo, (K)Ubuntu, Fedora, SUSE) And MS Windows. Installing Ruby 1.9 on Mac OSX, by Mikel Lindsaar. Installing 1.9, by Chris (NOTE: I used this one to install Ruby 1.9 alongside 1.8 under Mac OS X, since I already have the readline libraries installed from MacPorts I think). As you play with a tool you progressively discover various small tidbits about it. I have a few in mind and I thought it would helpful to share them in case you encounter them and get this weird expression on your face of "huh?". So, keep that in mind for the time being. They are thinking to make this behave as in the rest VMs but it's not sure yet since from what I've heard it does require some additional effort. Why don't you try yourself? In contrast, the JRuby team has an open ticket about a possible optimization where the interpreter will be able to understand whether the value is going to be used or not, thus avoiding the unnecessary Array allocation - cool! 2. The nasty Symbol#to_proc and the splat ( * ) operator. I've given some links about this issue before but I think here is more appropriate and some more explanation would be nice. First of all, for those who don't know what does this method do you can find a short introduction on this post from Dave Thomas and from plenty other resources (Dr Nic, Invisible Blocks and InfoQ) including a railcast episode for the more video-podcast-savvy people. Keep also in mind the possible downside of using this method as noted by Pratik Naik. Shall we go on now? Nice. and that's because the #inject method yields two parameters in the block (and so it makes sense for this to break I believe and that's why I didn't include a test case for something like this in the specs I wrote for the patch.). This week I've been playing with charlie (a Genetic Algorithms library) and I've been rewriting the TSP example that's included with it so I can have a very very simple "prototype" for the GRuVeR project. I must say that I kind of left it incomplete and that's because I wanted to test on which RVMs it's running properly and after fixing it for the ones that it didn't, what's the performance on each of them. Let's move to the alternatives now. Wow! There's quite some difference amongst them! To be honest, I really expected the vanilla Ruby to be the slowest (at least I hoped so) but no-no! It may be slower than 1.9 but it's faster than the rest of them. Obviously, Rubinius is out of the competition for this one. I believe that this specific code I tested is really an edge; the time required for rubinius to finish is practically infinite. After all it's the only VM that hasn't reached a 1.0 milestone yet so a lot of things will eventually get way better. Update: Charles told me that running this example with JRuby and Java 1.6 results in much faster execution, faster or close to Ruby 1.9 to be exact. Quoting his words: "ok...and if it's not as fast as YARV, file a bug for me :) " . Heh, so I guess he is probably right. I will try to test it as soon as I set up Java 6 in my machine (off-topic: it's a shame that Leopard doesn't ship with Java 1.6 included...). And also thanks a lot Vladimir for letting me know about the -J-server flag (I'm not that familiar with Java). The machine is a MacBook Pro with 2.2GHz Intel Core 2 Duo and 2GB Ram running Mac OS X Leopard 10.5.2. The source code for the tsp_solver.rb can be found here and it requires the charlie gem (of course you can grab the code from the repository and pack it under a lib folder or something and require that instead in the tsp_solver). Please, please, please keep in mind that this code, although it has to do with an almost real-life situation, is really specific and targeted! 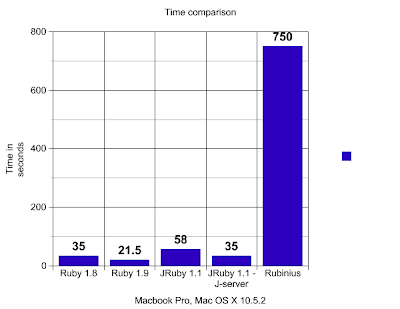 Don't take this comparison as a measure of speed between different Ruby implementations! I did it because I was curious to see the results and I will do it again a) when new versions of these VMs come out and b) with most of the code that I'm going to write for this project. This year is the last that I'm going to be a student, at least a bachelor one, since i've already completed (almost) my thesis and pretty soon I will be saying bye-bye to my University. I haven't really had the chance to participate in Google Summer of Code partially because I had never really heard of it (in time) and also because I didn't believe that I was able to contribute something really good (lack of confidence here :) ). But this year and after messing around with others' people code (heh) and some of my own (including my thesis) and with the help/ideas given by some friends I did finally sent a proposal. The main concept is to implement a library for solving Vehicle Routing Problems in Ruby. How is this going to happen? The ground basis will be the beautiful Charlie library, written by Sander Land, which makes it really easy to write programs with Genetic Algorithms built in and really fast (in terms of time required to write the code :D). James also pointed out Gecode/R which is frontend to Gecode and uses another technique, Constraint Programming and I'm trying to think if and how this can also be used (a discussion can be found on the Gecode/R mailing list). I'm not going to get into details here; if anyone is interested a part of the proposal can be found in the Ruby mailing list and the full version is available as pdf here. Feel free to send in any thoughts :). I'm really waiting for the ranking results and I reeeeeally hope that it will get accepted even though it's a really specific and targeted project when compared with others like contributing to the alternative VMs, refactoring RDoc (although version 2 is out) and such. The good thing with implementing this, is that it will produce some really nice benchmarks between the different VMs and also create some feedback with suggestions/patches/fixes (here are some examples from this Monday's experiments I was doing). Regardless though of whether or not it gets accepted, I believe that I will finally write this thing cause after a chat I had with Sander, which by the way is my potential mentor to the project, he also seems interested in this and willing to help. So, stay tuned for updates on this - later this day I'm going to post some benchmark results between almost all current Ruby VMs (Ruby 1.8, Ruby 1.9, JRuby 1.1 and Rubinius)* after running some example code I wrote for the Traveling Salesman Problem. * I'm missing the C# implementation of Ruby here but I thought that it won't be able to run on my Mac so I didn't bother to try it. If I'm wrong please let me know and I will also set it up right away! P.S. 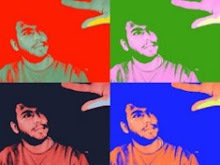 : Do you have a better name in mind for the project??? I'm not sure I like "GRuVeR". Wouldn't something like "delivery" sound better? It's been almost half year since my last post which was saying that I was going to move to nikosd.com. I haven't found the time and the money to pay a hosting server so i'm still here and since I have some interesting things to post I will do so here until I (finally) move to my own space. Updates are coming soon with my Google Summer of Code proposal, some benchmarks between different Ruby VMs and misc other stuff.